Rep. Jim Jordan (R-OH) has been accused of turning a blind eye to sexual abuse during his days as a college wrestling coach over 20 years ago, according to a report by NBC News. In April, Ohio State University announced an investigation into Dr. Richard Strauss, who passed away in 2005, over accusations that he sexually abused wrestling team members during his time as team doctor from the 1970s to the 1990s. Jordan was assistant wrestling coach from 1986 to 1994. He told the Columbus Dispatch in April that he “had not heard about any type of abuse at all,” adding that “no one reported any type of abuse” to him. 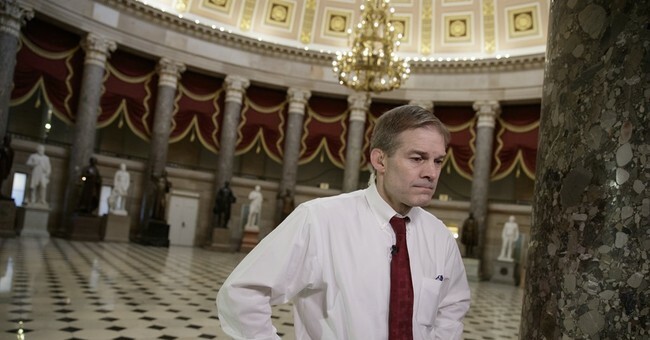 “Congressman Jordan never saw any abuse, never heard about any abuse, and never had any abuse reported to him during his time as a coach at Ohio State,” Jordan's spokesman, Ian Fury, said in a recent email to NBC News. However, three former wrestlers told NBC News that “it would have been impossible for Jordan to be unaware” with one wrestler saying he told Jordan about the abuse. Dunyasha Yetts, who wrestled at the university from 1993 to 1994, said he and others told Jordan about the abuse. “For God’s sake, Strauss’s locker was right next to Jordan’s and Jordan even said he’d kill him if he tried anything with him,” Yetts told NBC. The sexual abuse by Strauss was reportedly widespread, encompassing members of the football, basketball, wrestling, swimming, cheerleading, volleyball, lacrosse, gymnastics, ice hockey, soccer, baseball, tennis, track and cross country programs. “Ohio State has confirmed that investigators have received ‘confidential reports of sexual misconduct committed by Strauss’ from former athletes in 14 sports and from former patients in Student Health Services,” NBC reports.